Low-CG Chassis. Aluminum Upgrades. High Volume GTR Shocks. Brushless Power. The next-generation Slash 4X4 Platinum Edition features a Low-CG chassis and high-volume shocks to deliver the ultimate in short-course racing performance. The Platinum Edition arrives fully assembled and ready to complete with your transmitter, receiver, and battery (not included). 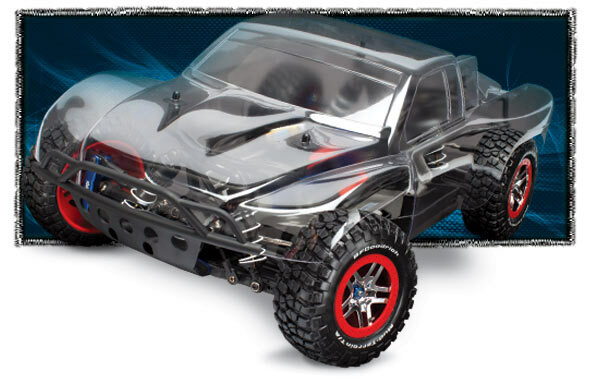 In place of the radio system, the Platinum Edition is loaded with Traxxas' premium option parts and accessories. Standard equipment includes machined aluminum suspension components, front and rear swaybars (including a set of extra stiff 'bars), and a clear body ready for your own signature paint style. The Platinum Edition also includes a sealed, silicone-filled differential to replace the installed Torque-Control slipper clutch when track conditions favor a center diff. 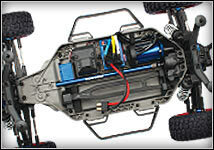 The Platinum's standout features are its Low-CG chassis and massive GTR shocks, both all-new for the Slash 4X4 Platinum. Slash 4X4 Platinum's performance refinements begin with a low center of gravity (CG) chassis that's unlike anything you've seen before. The battery (not included) and electronics are held as low as possible to position weight low in the chassis. Extreme Brushless Power and 4WD require a chassis that won't flex under load for arrow-straight, hard-charging acceleration. To offer the required rigidity, smoothly integrated ribs form a triangulated structure that's optimized for the loads imparted by the suspension and powertrain. Underneath, the chassis is ultra-smooth to reduce drag and prevent snags whether you're blasting through the whoops on the track or blazing trails in your backyard. The low-CG design dramatically increases corner speed and stability no matter where you drive. On the track, the low center of gravity allows the Slash 4X4 Platinum to put Velineon power down with superior traction, resulting in harder launches and faster lap times.